After years of renting, we finally purchased our first home in 2005. 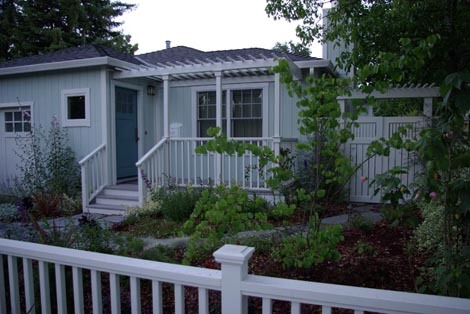 The house was fairly simple, but it had potential. 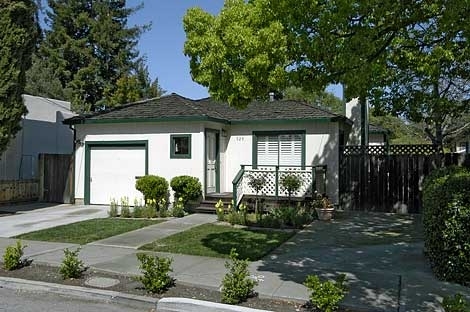 Finally, after five years, four contractors, and assistance from a landscape designer, our house has "curb appeal". 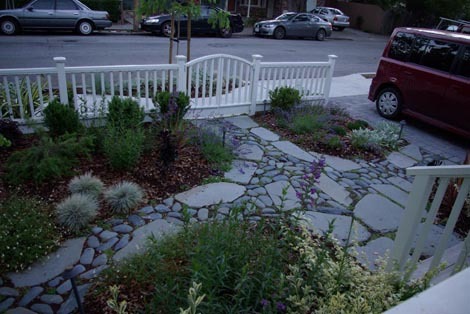 To assist with the landscape design, we hired Jeanine Gerstenfeld of Garden Visions. Jeanine drew up the complete landscape plan, including detailed plant specifications and planting locations, and worked with us to design the pathway layout and lighting placement, as well as the general fence design. The landscaping work was done by Nick Bullock of Bullock's Countryscapes, Inc. Nick worked independently, doing every aspect of the project himself, from removal and disposal of the concrete, custom building of the fence and arbor, installation of the plantings and irrigation system, and design and installation of the new driveway pavers. Nick worked every day (weekends and holidays included) from the start of the project to the finish, and with his years of experience provided good tips and recommendations in the implementation of the design. Our neighbor, Abner Barrios (A. Barrios General Building Contractor, Painting & Decorating), provided the finishing touches, designing, building and installing the front and side gates, and painting the house, fences and gates. Abner's our "go-to guy" for projects around the house, and has also installed our new windows and doors, including replacing our old sliding patio door with french doors. From start to finish, the house got a new roof, all new front windows and doors, a new porch (with an added pergula roof), and new gates. 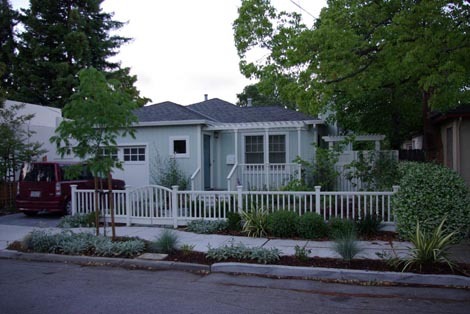 All existing concrete was removed, and the soil was tilled and amended. The front fence was added with swinging entry gates, an irrigation system installed and new trees, shrubs and plants were put in. Even the sidewalk was replaced, with a curve added to accommodate a Chinese Pistache tree planted in the median strip. Finding good hinges for the swinging gates was a challenge - the first ones we tried were called cafe hinges, and were not solid enough to bring the gates back to a nice centered close. We finally found double-action spring hinges, the same type that are used for those swinging doors in restaurant kitchens. 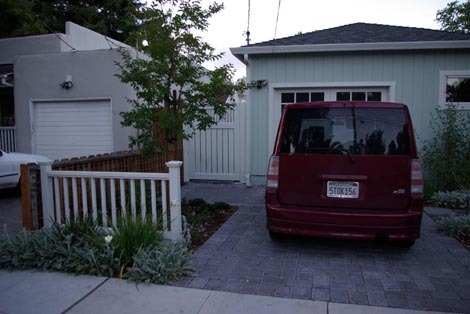 The old concrete driveway was replaced with stone pavers, and we replaced the solid garage door with one that mimics the six-pane window style of both the new front door and front windows. Having natural light in the garage makes a world of difference. An arbor was added to the main gates on the right to match the style of the pergula porch roof, and the whole house was painted in Antique Jade with April Showers used for the trim, gates and fences. 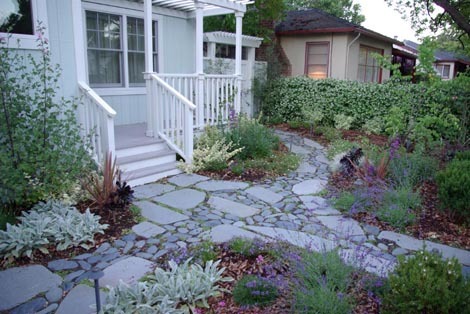 Mary Lou designed the pathways, using Connecticut Blue Water Wash stone with smaller, darker blue San Pedro Pebbles used to create the feeling of water flowing around the larger stones. We now have the best looking house on the block (well, at least it is to us! ).